"I'll admit it. I just didn't believe it, Boy, was I wrong. When Schweiss says you get more for your money, they're not kidding! One look at the heavy cylinders and the hydraulic pump, I have NO shame in saying that I show off my new hydraulic door every chance I get!" The original brand name "One-Piece" Hydraulic Doors by Schweiss are unrivaled in the door industry thanks to their quality, innovative design, and price. No door is too big or too small, Schweiss can build a hydraulic door to fit your clear opening. We offer a number of options and features to customize each "one-piece" hydraulic door. A hydraulic door consists of a one-piece frame, two heavy-duty cylinders and a powerful electric pump. This efficient design makes hydraulic "one-piece" doors ideal for any kind of building. Each hydraulic "one-piece" door we build is custom-fabricated to the customer's specifications to ensure a proper fit. This customization allows you to build the building that fits your needs without worrying about how to make a hydraulic door fit into your plans. Whether you build a small aircraft hangar or a large warehouse, each "one-piece" hydraulic door will easily blend in with the building. You can find a popular Schweiss "One-Piece" Hydraulic Door on every kind of building ranging from aircraft hangars to agricultural buildings. With over 35 years of experience in the door industry your "One-Piece" hydraulic door is guaranteed to be of the highest quality. This site will show you the many advantages and benefits of the hydraulic "one-piece"door and why thousands of people have chosen the Schweiss "One-Piece" Hydraulic Door for their buildings. Schweiss hydraulic door customers recommend us as their #1 source for high quality "one-piece" hydraulic doors. 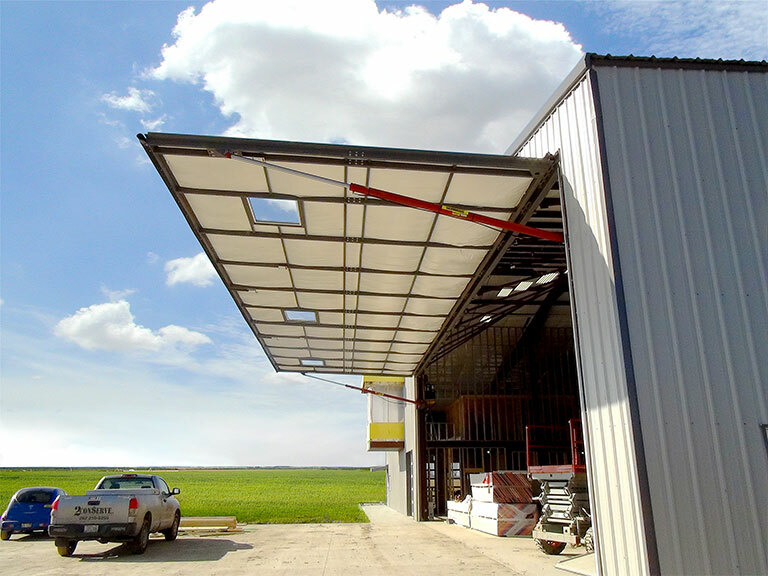 Consider a Hydraulic "One-Piece" door when planning your next building or hangar door. When you need to save headroom a hydraulic "one-piece" door by Schweiss is the perfect solution. Hydraulic "one-piece" doors allow you to have the same clear opening without the added cost of a taller building. A hydraulic door is a solid one-piece door that connects to your building with a single set of hinges that swing out and up.